Clearly, ankle holsters are not the first choice for carrying concealed. They're slow to access, often uncomfortable, and it's hard to reholster your pistol. And the good ones are expensive; in fact, one of the most expensive styles of holsters. But for someone in a suit and tie (or someone in long pants in the Florida heat), it might be the only effective way to carry and truly remain concealed. And it's also a great way to carry a a last-ditch backup gun (hence the name). The Last Chance is our own unique ankle holster. It's made with three different kinds of leather, each of which is selected for a specific purpose. 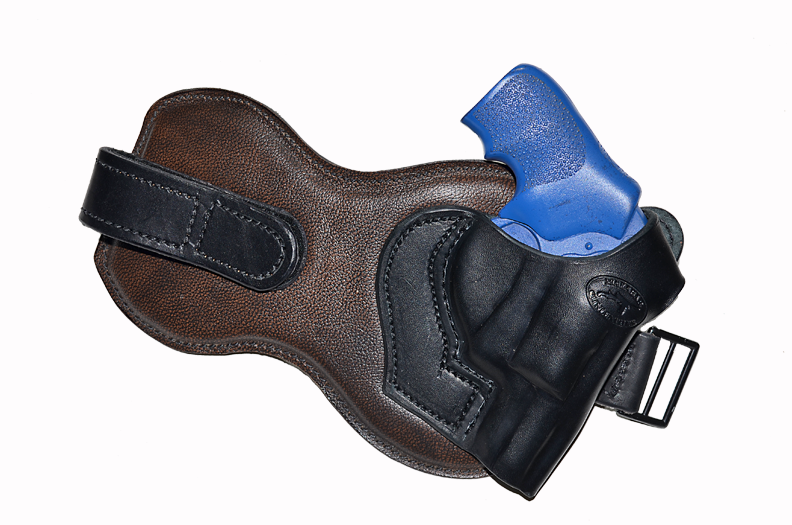 The holster itself is our drum-dyed black Hermann Oak saddle leather. It has the body to make a lightweight but tough shell that will mold to your handgun like a glove. Because ankle holsters have to deal with a variety of bangs and bumps, the pistol is secured with a thumb strap that features a recessed snap. The ankle support is a sandwich of two layers of chrome-tanned upholstery leather, which is both very thin and very tough (not to mention beautiful), and a 3/8-inch neoprene pad, which provides cushioning. The Velcro-lined straps are made from Hermann Oak bridle leather, which is tough but flexible in all weather conditions. The result is a secure ankle holster that can be worn comfortably all day long. Options include rough-side out on the inside of the pad, heavier padding, and other leather options. For whatever it's worth, my wife thinks this is the sexiest holster we make. All ankle holsters are most effective when used with smaller, lightweight handguns like the J-frame snubby and Ruger LCR. So if you're looking for deep-concealment rig that can be worn with a suit, or a place to stash a backup gun in case everything goes FUBAR, our ankle holster may be your best, Last Chance. The Last Chance is $125 in most configurations (horsehide and custom dieing are extra). Please let us know if you have unusually large ankles.